I hate wasting food, but I also like eating fresh food no matter how long I have to store it and so am always looking for a machine that will help me achieve both. 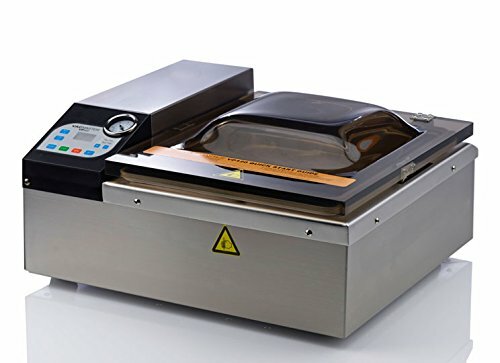 In my search for the best vacuum sealer, I came across the Vacmaster VP120 and just by looking at its stainless steel firm body I could tell there was something special about it. And when I got to use it the results that I got from this two cylinder piston pump machine were impressive. Apart from getting the job done fast, it also makes perfect seals thanks to the double seal and so you never have to worry about not getting a seal right. And with many other excellent features, this is one of the best vacuum sealers that you will ever use. Digital Control and Pressure Indicator: The digital control panel is easy to read and use for better control of the sealing process. The pressure indicator has also been designed to make it possible to read even from a distance. 2 Cylinder Piston Pump: VP120 functions with a two cylinder piston pump that gives it an incredible power but the best thing is that it requires no maintenance at all, and so you will not have to spend an extra coin on it. Body: This vacuum sealer has a stainless steel body for maximum durability. Apart from durability, stainless steel also makes it more aesthetically appealing and so it will look beautiful in your kitchen. Seal Bar: It has an 11.5 removable seal bar that lets you seal wider mouth pouches with ease. It also has a double seal wire that ensures that you get a seal that is twice as sturdy as other machines. Cycle Time: This sealer has a cycle time of between thirty and sixty seconds and hence offering you versatility, speed and the freedom to choose how a seal is done depending on the particular food you are storing. Automatic Lid: You don’t have to worry about the top as it is not only transparent to help you monitor sealing, but it also closes when you push the start button. Weight and Dimensions: The total weight of this machine is 58 pounds while its dimensions are 19.25 x 16.75 x 9.5 inches and that of the chamber are 11.75x 11.5x 4 inches. Pouches: When you buy the VP120 you get 75 bags free as a starter package. And so you can start using the machine immediately you buy as it comes with everything needed to vacuum seal food. The VacMaster VP120 is one of the best vacuum sealers ever made, and it has been designed to cater for all your storage and vacuuming needs. It will also last for many years without any breakdowns or need for regular maintenance and hence making it one of the best machines to own. The fact that it can get the job done fast and efficiently is enough to convince anyone to buy it. And although it may cost much more than others in the market the value that you get from it will justify the cost. Whether you vacuum seal food regularly or occasionally, this is a wonderful machine to have in your kitchen.